Students who wish to double major in Philosophy and Religious Studies may take up to nine credit hours (three classes) that will count toward satisfying the requirements of both majors. 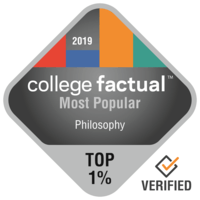 These nine credit hours will count toward the “Electives” part of the Philosophy major, in either the General Track or the Ethics Track and toward the emphasis and elective parts of the Religious Studies major. The student will still need to fulfill all the core and area distribution requirements for both majors.